"This series begins with a war between Earth and the colonies that are similar to the One Year War of the original Gundam series [snip]. On one side is the Earth Alliance, and on the opposite are the space colonies that form ZAFT (Zodiac Alliance of Freedom Treaty). Mankind is divided over human genetic engineering, with normal humans known as 'Naturals' and the genetically altered humans known as 'Coordinators'. Like the original series, ZAFT has a head start on mobile suit design, the Earth Alliance quickly catches up with its five prototype Gundams. With ZAFT having stolen four of the prototypes, young pilot Kira Yamato takes the Strike Gundam and is forced to fight against his old friend Athrun Zala. 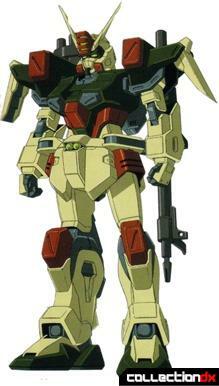 Little do they know that there are sinister forces at work that go far beyond their worst nightmares..."
"Designed as a long-range artillery mobile suit, the Buster's armament consists solely of long range weapons, including a gun launcher, a high-energy rifle and two missile pods. One weakness of the suit lies in its complete lack of any close combat weaponry. This fact is later corrected with the mass production model, the GAT/A-01E2 Buster Dagger. Like the other X100 series G prototypes (GAT-X102 Duel and GAT-X105 Strike), the Buster is based on an agile, non-transforming frame system (it is in fact based mostly on an application of the Duel's frame)." The Buster has a high range of motion, with double-axis joints just about everywhere insuring a minimum of 90-degrees of motion everywhere. The four front and back skirt armor plates have ball joints and are quite flexible (though they tend to pop out easily). The waist and upper torso joints cannot be moved until the cannons are un-pegged from their stored positions in back. And to help wield the extended combined weapons (see below), the shoulders have a third expanding joint that lets them pull away a little from the torso. The tan panels on the outer edges of the shoulder armor can be swapped for versions that have intentional holes in them. What these additional hard points are for, I have no idea because they were never used in the show, and I have never seen or heard of any other Gunpla figure or model with them. The box does make mention of the fact that there’s another fixed pair of [unused] hard points behind each forearm. An asymmetrical display stand is provided, which needs to be assembled out of the box. A clear-plastic arm features shoulder, elbow, and wrist joints respectively. The peg at the end of the arm only fits into the hole in the back of the crotch. The main feature of the Buster is its long range cannons- a 350mm Gun Launcher (left side) and a 94mm High-Energy Beam Rifle (right side). These rotate around to form large under-the-arm cannons/rifles, used singly or in tandem. 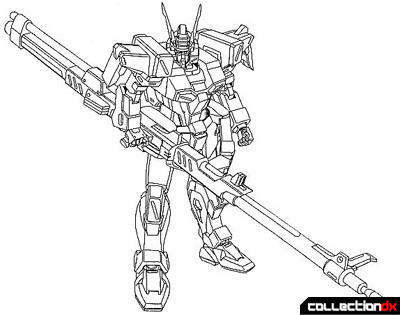 Not too unlike the over-powered Twin Buster Rifles of the Wing Gundam ZERO from the earlier “New Mobile Report Gundam Wing” (1995), the Buster’s cannons also combine with each other to form more powerful weapons. To wield such extended-size cannons and compensate for their larger blast recoil, extra retractable handles extend out to provide the Buster with a better grip. When the Gun Launcher is pegged into the back of the extended High Energy Beam Rifle, this combination forms the Hyper Impulse Long Range Sniper Rifle. When the High Energy Beam Rifle is pegged into the back of the extended Gun Launcher, this combination forms the Anti-Armor Shotgun. I suppose that as this is my first Robot Damashii set/review, I am obliged to say I too sampled some US-release Mobile Suit in Action figures back in the day, and find this line to be of a superior quality to MSiA. It is not a toy, hence the unsurprising lack of PVC which haunted MSiA. It is, however, of a similar size, being an inch-and-a-half taller than my only surviving MSiA (a Gundam Heavyarms Kai), and has more than adequate paint and surface details. It is still smaller than your average 1/144-scale Gunpla. The articulation is just what the doctor ordered, and does pretty much every pose one could imagine. (Of course, having a three-jointed display stand provided doesn’t hurt either. But I digress.) Surface details and paint are also certainly up to spec (though I still can’t figure out why they included white, but it fits in nicely, so I won’t complain). The cannons are also well crafted, with no wishy-washy soft curved corners so kids will poke their eyes out a little less. On those points, this figure is an unquestionable winner. Unfortunately, the focus of this particular mobile suit is also the most difficult to deal with in this figure. The cannons are rather unwieldy. First-and-foremost, the arms that these cannons attach to at the waist are quite thin, and this might have been a really good place to utilize some die-cast metal strictly for structural strength. I don’t know if other Robot Damashii releases use metal in their construction, but this one definitely needed it in those arms. And what makes them even more precarious is those four ball joints you hooked-up before ‘playing’ with the figure are very tight. In this particular case, that’s both good and bad as they straddle that ultra-fine line between holding their positions for long periods of time and breaking under too much friction when you try to move them! So, for as good at articulating as they are, you also curse their existence at the same time. Now, the whole point of having those connecting arms is so that the mobile suit can wrap the cannons between its main arms and its torso for duel-wielding auto cannon action. And they’ve done that more than a few times in other Gundam series (of notably prominence for the first time during the “Mobile Suit Gundam F91” movie). However, I’m not certain if it’s a matter of TV animation magic or CAD toy sculpting, but either way it didn’t turn out very well here. The cannons turn more into oversized deodorant sticks than hip-mounted blasters! The arms can barely get around the diameter of the cannons, and the cannons themselves hang way too far forward compared to all the official lineart and animation I’ve seen of the mobile suit where there should actually be a little of each one hanging out behind the torso. And regrettably the two combined cannon modes are just an extension of the problems above. While the cannons fit together great, the arms just aren’t long enough to reach the cannon handles without straining and popping off their joints! Whichever arm is brought back is scrunched tightly in a position that often leads to the hand slipping off of the handle, and the arm reaching forward doesn’t have enough reach even with the bonus shoulder joint extended. Now, while the primary arms have trouble getting anywhere near screen-accuracy, ironically it is the smaller gray connecting arms that stay in position very well, so the blame in combined mode coincidentally seems to shift from one pair of arms to the other! Having given the matter a little bit of thought, I’m guessing that the torso could have used a few more millimeters of height, and the length of the cannons could have been trimmed down a few millimeters so that the four handles across the two cannons’ lengths would have been closer together. This could have been done without affecting the proportions of the figure either. Despite the annoying difficulties in getting the cannons to do what you want them to do, I still do not consider this figure to be a bust. My lack of experience with other Robot Damashii figures aside, I find that this release of the GAT-X103 Buster Gundam is quite satisfying from both visual and articulation standpoints. Those holes on shoulder armor are hardpoint system that will enable weapons from other Robot Damashii to attach to them. It first appeared in RD RX-78 then Zaku, then Gouf Custom. I think there is RD Zaku review here in this site if you want to check. But Buster doesn't have any mods that I am aware of, even in SEED-MSV. Verde Buster is a completely different figure from this one, so that mod is out too. Well it doesn't have to be official. Nobody said you can't mount UC weapons on CE suit. Part swapping is always fun. Afterall, we never saw RX-78 with crazy amount of weapons attached to it in the anime, yet RD heavily encouraged people to do that. Or maybe they're planning to release some newly designed add-on for CE suits someday. Robots spirits have never used die-cast, mainly because it would probably increase the price. Generally speaking toy/figure lines either include die-cast in every release, or they don't, simple as that. Having bought a few robot damashiis, this sounds like a relative disappointment for the line, but still not a bad release. Well, the Buster doesn't lend itself well to accessories (at least none that I've heard of), so there isn't much variety there. It may not have as much flash as other RD releases, but if it wasn't for the difficulty in dealing with the primary gimmick, I'd still have given it a good rating. It's got a huge gun, and the framework to attach any number of other weapons you have from other releases. Seems like the perfect setup for accessories to me. I think it's rad they threw in the hardpoints as a little something extra for people who own some of the other figures and like to really play with their figures. We've also covered a number of other hardpoint compatible RD releases on CDX, so it seems like anyone picking one of these up should be aware of that system of interchangeability. Sorry, I didn't put that together until after this review had already been published. Maybe I should have looked closer at previous RD releases before I wrote this.